Olive oil is extracted from the fruit of the European olive tree. ‘Virgin’ means the oil was produced by the use of physical means only - no chemical was involved. The term virgin oil referring to production is different from “Virgin Oil” on a retail label. Extra-virgin olive oil comes from the first pressing of the olives, contains no more than 0.8% acidity, and is judged to have a superior taste. 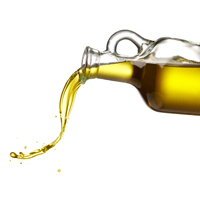 There can be no refined oil in extra-virgin olive oil. This emollient plant oil has anti-aging properties and contains saponins. Some tests show that topically applied olive oil can protect against UVB damage. It is a good antioxidant as well as a good moisturizer. In penetrating power it is superior to mineral oils. Many soaps, creams, anti-wrinkle products and massage oils include olive oil as an ingredient. See natural moisturizing factors.